Deadheading removes spent flowers from a rosebush, improving the look of the plant and preventing the hips from forming. Cutting dead roses away just above a five-part leaf encourages floribundas to bloom again, according to Better Homes and Gardens. Stop deadheading floribundas in the fall. Allowing hips to form slows plant growth and prepares it for winter. Clean pruning shears with rubbing alcohol. Remove the roses as soon as they fade. Use clean, sharp pruning shears and avoid crushing or damaging the cane. Remove flowers by cutting just above the uppermost set of leaves with three leaflets during the first year after planting. Cut at a 45-degree angle approximately 1/4 inch above the leaf bud, cutting away the flower and cane below it. Cut above the first outward facing bud of a leaf with five leaflets after the first year. 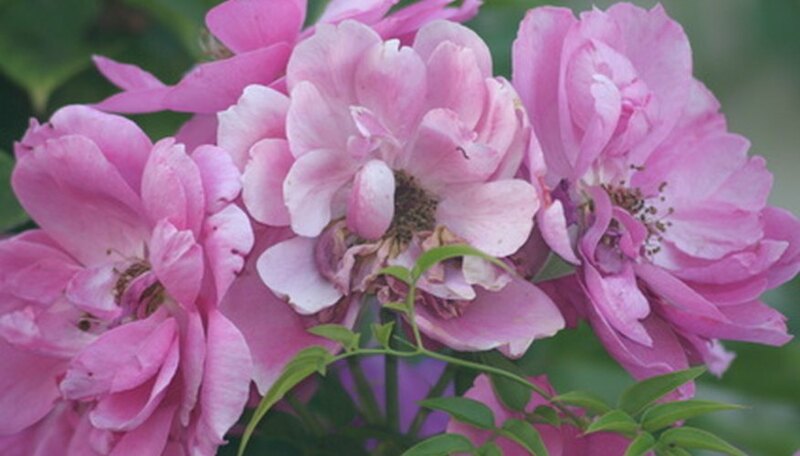 Trim older roses as desired, leaving at least two sets of leaves with five leaflets on each cane. The deadheading procedure varies for different types of roses.